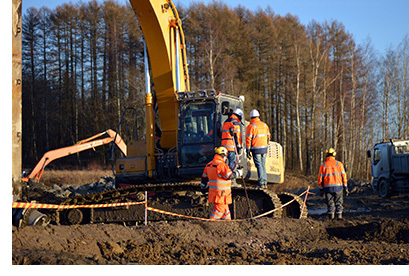 Mass stabilization is a ground improvement method for soft or contaminated soils, which by adding binders makes the areas with low quality soils technically and environmentally fit for construction. Mass stabilization allows for carrying out infrastructure projects in wet areas and in the areas with soft soils at reasonable costs without expensive piling or huge mass replacements. The soft soils include clay, sludge, peat, silt or sediments. In the past 10 years, the mass stabilization technology and its applications have been under intense development by the leading experts, such as Allu, Ramboll, YIT (former Lemminkäinen Infra), Rusol, Nordkalk, Finnsementti and Keller. The mass stabilisation method is spreading rapidly to every part of the world. Welcome to these pages to explore the mass stabilisation technology.